Save Meryl to your Collection. Register Now! Meryl Pataky received a BFA in sculpture from Academy of Art University in San Francisco in 2010. She creates work that relies heavily on personal narrative. 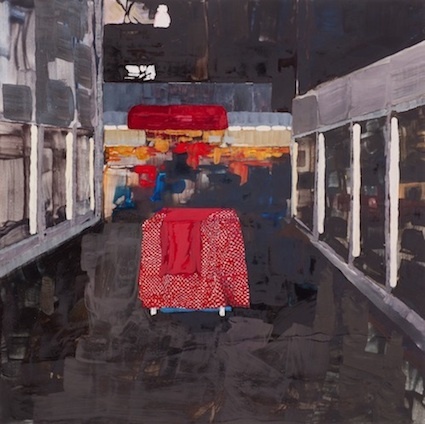 Past experiences inform her work not only conceptually but also materialistically. ‘We are all molds that are filled with different substances. These are a delicate blend of our paths, experiences, beliefs and interactions that form our being,’ says Pataky. 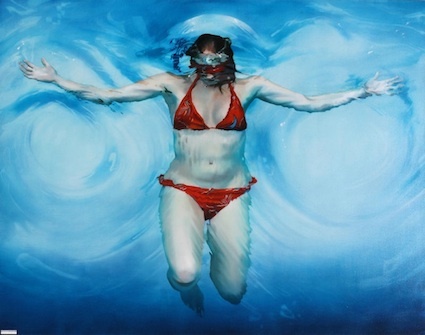 Her work has been exhibited in several group shows in California. ...and just because you don't 'get it' does not mean it is not art. sorry. i don't understand a thing in this kind of art. yes. i am spoken to with neon light, waw! light filaments, coils pass on a message..extraordinary! magical, enchanting...no chance of ink fading away, badly traced, or any other sorry event perhaps of some distorted line, or a dot that may mean nothing...here there's no waste or extraneous medium. a tiny filament englobes an entire thing called writing, lettering...flashing and shining constantly until turned off, leaving nothing. no art work, nothing as if erased completely...not totally; when turned off it leaves everything without light, hence electricity. you have figured it out by now that the light originates from electricity. that is science not art! I enjoyed reading the comments posted - very well done - everything becomes art - eventually - without NEON lights where would Las Vegas be? I wouldn't call this art. Do you call the neon signs in a bar art? No, so what qualifies this other than the "meaning" behind the words. 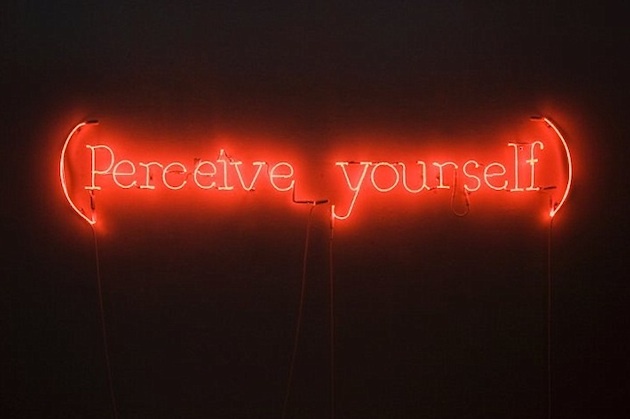 I think the great thing about artists today is that they are unfettered by their choice of medium- whether it's social sculptures (Rirkrit Tiravanija) or neon (Meryl Pataky). Craft vs. Art? Yawn. To suggest that these pieces are not art because the material traditionally falls into a more commercial category is nothing short of obtuse. High praise for artists who have the creativity and insight to transform commercial mediums and make them their own. Definitely art. Definitely an artist. Though she needs neither pronouncement from me (or anyone else) to say that it is so. A thorough tour through the artist's website would do a great deal to inform the uninformed on what it is to create, to create art, to be and to be an artist. Her mediums may present some obstacles to the dry minds of the overly conventional, but she has much to say to all of us and her own unique and, yes, artistic way of saying it. I hear it. I see it. And I'm listening and looking for more in the future. She has room for growth, as do we all. Oh and P.S. - Brian, how is this not pushing the medium? From her website, it says that Swing of Things is 10 ft tall! It's been said by others in the industry that Meryl is doing neon that nobody has ever done before, pushing the medium to the limit. You seem to be the only one stuck in the 60's. Brian - "Green Shirt" - less glass?!?! So much glass!!!!! More glass than in either of these pieces!!! Mike L - Today's technology? 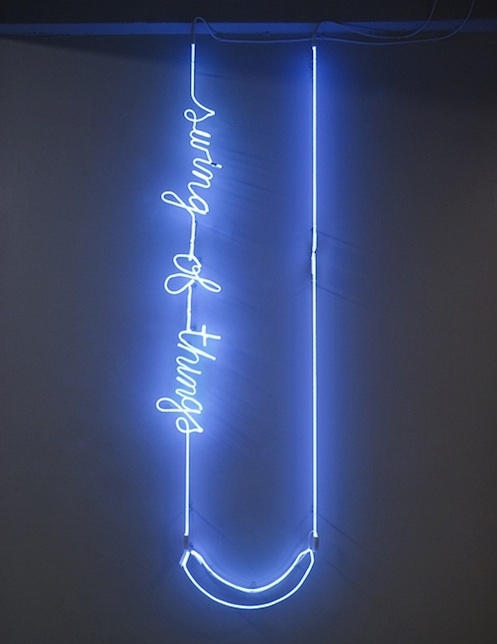 What does technology have to do with neon? Neon has been around since the beginning of the 20th century. Perhaps you aren't aware that all neon is handmade - there is no machine made neon. Every sign you see, even the open signs in your local store, are hand done. Some may argue that neon is anti-technology since it's one of the oldest forms of creating light from elemental gasses and electricity. The science and technique involved are masterful and intoxicating. To all - please educate yourself on the "craft" before judging it. And educate yourself on the meanings behind works before coming to your final conclusions. Meryl is using the craft as art. It is the same thing with jewelry. Jewelry is a craft. People learn it. It is taught. What people do with the craft after they use it is what makes it art. These are not just signs.